Both the Apple AppStore and Google Play allow customers to post reviews. The intention is good: allow customers to see feedback from current users before they make a decision to buy the software. For the developer the endorsement of good feedback is therefore really valuable in generating additional sales. This becomes even more important as the stores become more crowded with competing apps. * Firstly users frequently use the AppStore feedback when they need support. Apple intends the feedback to be for other customers, and they make it relatively hard for developers to see the feedback without resorting to 3rd party tools to scrape iTunes. Even worse, when you do see feedback there is no right, nor possibility, of reply (there is in Google Play). As a developer, it is unbelievably frustrating when someone makes a comment for which there is an easy answer to help them and there is no way of telling them. * Secondly there is the weighting given to feedback for the current release. On the whole this is a good thing when it's informing potential new customers. However there is a catch to this particularly for relatively niche apps. This is that there is a disincentive to developers to release minor updates that will reset good feedback which has been accrued. It has therefore become popular for developers to add popups within the app to encourage users to leave feedback. This can be set so that only regular users (who one can assume are happiest with the app) are prompted to leave feedback. This technique is itself now coming under scrutiny for being intrusive - especially when a user has said that they don't want to leave feedback and yet are prompted again after another update. I have gradually followed the crowd and begun using pop ups to prompt for feedback in my apps - but would rather not. In fairness, I'll check that from future releases I'll permanently honour a user request not to be asked again. 2. The ability to reply to user reviews. This should be forwarded to the user which Apple could do without breaking and user confidentiality. Optionally this original reply could be public although I see that is more complicated and leads to a further question of a right to re-reply from the user. I think that receiving an answer from the developer would prompt most customers to continue the conversation if they had further questions - and most would act reasonably and update their feedback if it was no longer valid. 3. An API or similar means to enable developers to provide a seamless, in-app route for users to provide ratings and feedback. Although this could still be tightly controlled by Apple, it would be easier for users to provide ratings - so hopefully encourage more from which the overall picture is clearer. this is duplicated also. 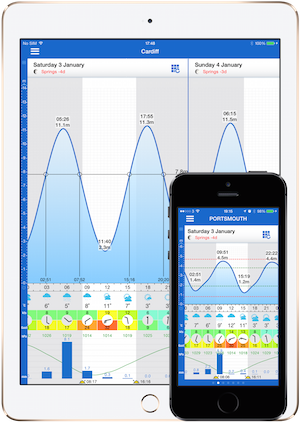 Also the tidal stream HW and LW do not tie up with the tide data shown in the tide table, I am at Poole harbour.